Image example Saraki say wetin policemen wey go raid Clark house do na threat to democracy. 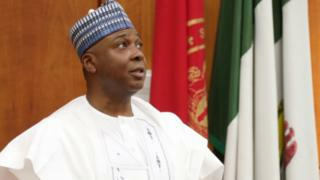 Senate president, Bukola Saraki don call Nigeria police force to do open and correct investigation for di way wey some policemen go search di house of Chief Edwin Clark. For im Twitter handle oga Saraki say wetin di policemen wey go raid Clark house do na threat to democracy. "Evribodi know say di second republic senator na somebodi wey no dey cover mouth for national issues." Police oga patapata, Ibrahim Idris, don already say sorry to chief Edwin Clark but Mr Saraki say di sorry no do. "Now wey be say di Inspector General of Police don deny say im no give order for di raid, di next move na for dem to do correct and open investigation." According to Saraki, if police get correct reason to search di elder statesman house, nobody go blame dem. But say dem no see di illegal weapons wey dem find go, e mean say somtin dey inside. "Di action of di Police no shows odas good image of our kontri. E show serious abuse of state institutions. "All dis kinds of jagajaga tins must stop. Dis kontri don experience peaceful change for 2015 because di goment wey dey power allow democracy to work".